This is a summer favorite at my house. 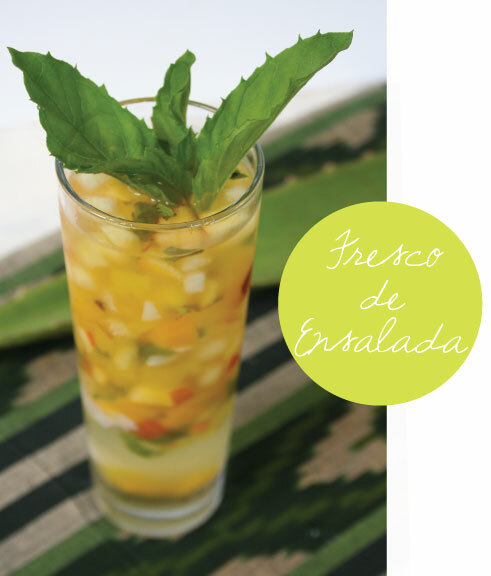 It is a traditional Salvadorian ensalada drink and is so easy to make; this variation of it is too and it's, oh, so refreshing on hot summer nights. My kids think it's a dessert and that is fine by me! Fruit: Apple, pineapple, orange and mamey are the traditional fruits used. I used mango, apple, orange, coconut, plum and nectarine. 1/3 cup or so of each. 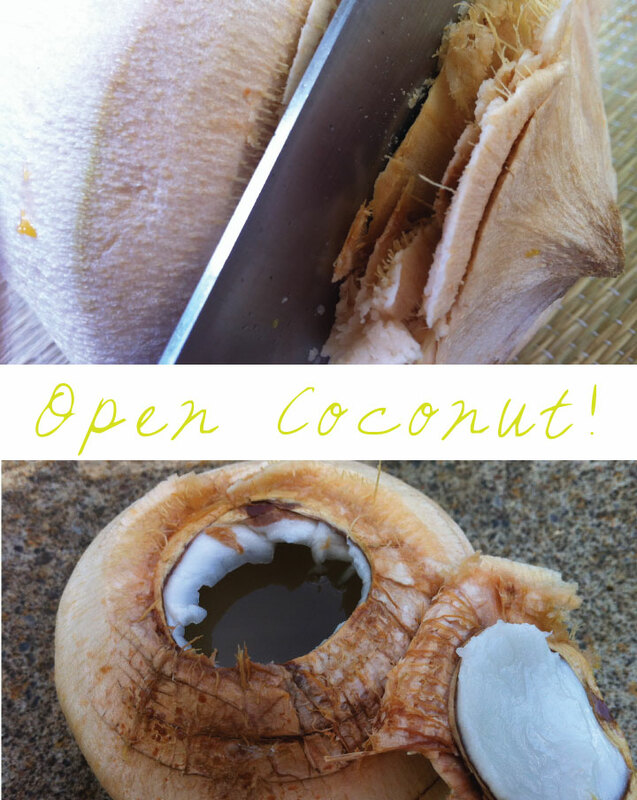 Coconut water: I used two fresh young coconuts and cut it open so I could use the pulp as well as serve it in the shell, my kids love that too! I also used about 12 oz of coconut water I bought at the store. It's everywhere these days - not hard to find at all! No coconut water? See bottom of post for variations. Mint - about 1 tablespoon minced plus some sprigs for garnish if you are feeling like getting fancy. Cut up all your fruit into tiny little bit sized pieces. I am no master chef so this takes me forever! 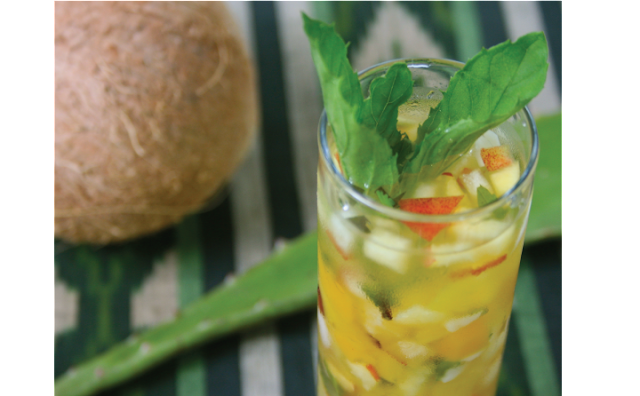 Place fruit in a serving pitcher and pour coconut water over top. Mix in minced mint. Refrigerate for at least one hour so the fruit juices are released. I usually make mine at night and just let it sit overnight. That's it! 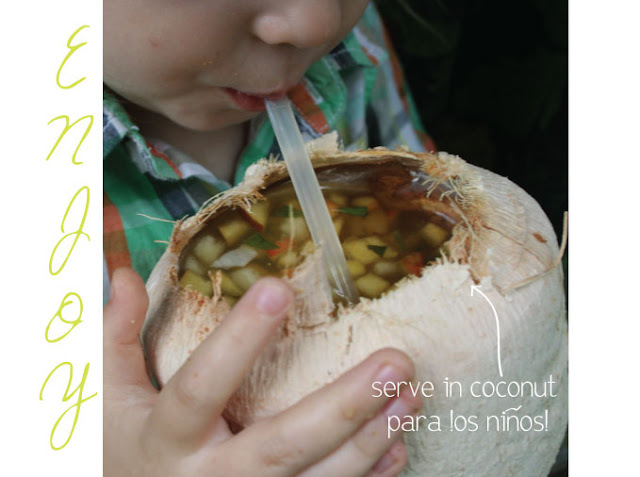 It's a great non-alcoholic drink to serve to kids or non-drinkers during summer parties too. If you are looking for something a little more creamy you can also add some coconut milk. And if you don't have coconut water you can just add water with a little citrus juice. As always with my recipes they are really just basic ideas that you can do what you like with! There are so many ways to get creative with this drink. Oh, and if you find yourself with no liquid left and extra fruit at the bottom of your pitcher put it on top of ice cream of yogurt, yum! Christine! This looks scrumptious! Can't wait to try this drink out.... hmmmm... do the El Salvadorians ever add a little rum or something ;) lol! Blessings to you and yours! Thank you for sharing this delicious custom. The best kind of 'desserts' are the healthy ones, and what a neat way to serve the drink! Oh my that looks yummy, we don't have fresh coconuts here. In fact on more than one occasion the coconuts we have bought were rotten :( We are way up in Canada though. Still looks super yummy. i love this! Something new that Rowan could drink! oh you don't know how jealous you just made me. No young coconuts in NYC and I am always dreaming of that (especially on these hot days). This drink looks amazing though.